All survivability talents, Heartbreaker is the standard talent for this tier, as the extra Runic Power is a great boost for more Death Strikes. Blooddrinker can be useful for encounters where the DK has to move out of damaging effects, allowing them to heal with doing so, while Bloodworms can provide a small boost to DPS along with the healing effects. Rapid Decomposition : Death and Decay deals damage 50% more often, and while in Death and Decay the DK generates 20% more Runic Power. This tier offers some choices on methods of controlling passive effects. Soulgorge allows for control over Rune regeneration, but makes the AoE rotation more complicated. Rapid Decomposition is useful for encounters where the DK can maintain position within Death and Decay. Spectral Deflection provides a higher spike damage survivability bonus. Anti-Magic Barrier : Anti-Magic Shell also increases the DKs maximum health by 25% for 10 sec. Blood Tap : Generates 1 Rune on use. Recharge time reduced by 1 sec whenever a Bone Shield charge is consumed. Ossuary : While the DK has at least 5 Bone Shield charges, the cost of Death Strike is reduced by 5 Runic Power. Additionally, increases maximum Runic Power by 10. More control over survivability in this talent tier. Anti-Magic Barrier offers some additional protection against spike damage to an existing defensive CD. Blood Tap allows the DK a significant amount of control over Rune regeneration, allowing the player to use Runes when needed most. Ossuary has a good deal of synergy with other talents that provide boosts and control over Runic Power generation. Mark of Blood : Places a Mark of Blood on an enemy for 25 sec. The enemy’s damaging auto attacks will also heal their victim for 2% of maximum health. Red Thirst : Spending Runic Power will decrease the remaining cooldown on Vampiric Blood by 2 sec per 10 Runic Power. Tombstone : Consume all Bone Shield charges. For each charge consumed, 3 Runic Power is gained and the DK will absorb damage equal to 3% of maximum health for 8 sec. Level 60 talents focus on choice for self-healing. Mark of Blood is an effective damage reduction ability, allowing healing for each auto-attack from the target. Red Thirst gives the DK the option of using Vampiric Blood more often, while Tombstone allows for the DK to turn Bone Shield into a more powerful single-use defensive cooldown. March of the Damned : Wraith Walk lasts 50% longer and breaks stun, snare, and root effects when cast. Tightening Grasp : Reduces the cooldown on Gorefiend’s Grasp by 60 sec, and Death and Decay also reduces the movement speed of enemies within its radius by 70%. Crowd Control is the theme for Level 70 talents. March of the Damned allows for the breaking of CC on the DK, which increases mobility. Tightening Grasp is an excellent talent for encounters with high number of adds, while Tremble Before Me has the potential to create passive spell interrupts on enemies within Death and Decay. Foul Bulwark : Each charge of Bone Shield increases your maximum health by 2%. Rune Tap : Consume a Rune to reduce all damage taken by 25% for 3 sec. Has 2 charges. More survivability choices in this tier. Foul Bulwark has some interesting synergy with talents like Ossuary. Rune Tap allows the player to have another defensive CD to use with some careful Rune management, while Will of the Necropolis smooths out damage taken at low HP levels. Three very strong talent choices at Level 100. Blood Mirror is a great defensive CD that also provides a single target DPS increase, while Bonestorm does the same in AoE situations. Purgatory is a free cheat death, but healers will need to be aware of the absorption effects and react accordingly. The Maw Must Feed: after killing a non-elite humanoid or demon, you receive a 30-second buff granting 1% increased damage. Stacks to 10. Consumption: Strikes all enemies in front of you with a hungering attack that deals 250% Physical damage and heals you for 100% of that damage. 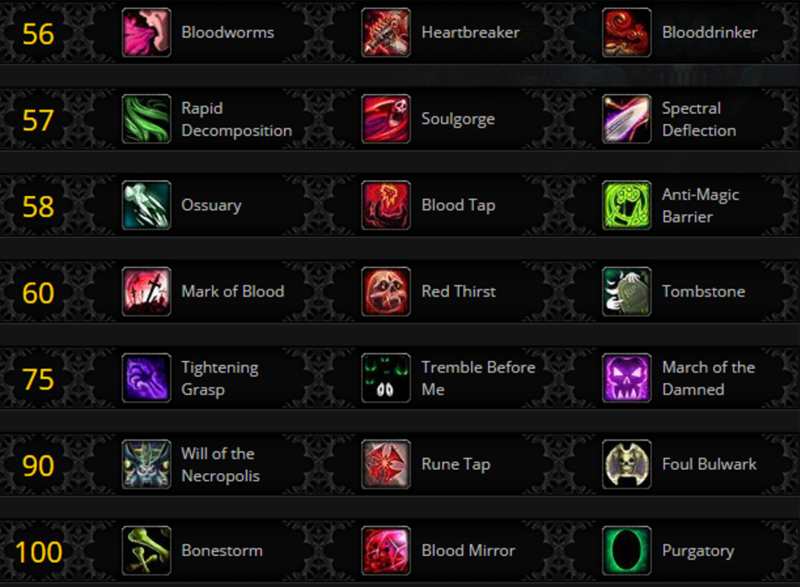 This guide will be updated with trait descriptions and paths closer to the Legion launch. The goal of play for a Blood Death Knight is to properly manage both Runes and Runic Power in order to effectively survive while tanking. In addition to watching resources, the Blood DK must keep track of ensuring that Blood Plague is maintained on all targets, and that Bone Shield is maintained, usually to 5 stacks. Death Strike: This active mitigation ability allows the Death Knight to both heal himself as well as create an absorb shield through Mastery: Blood Shield. While trying to keep the shield up is a bonus, Death Strike should be looked at first as a healing ability. Try not to use this when at or near full health. Bone Shield: The other active mitigation ability, this is the most important ability to maintain during any encounter, as it not only grants 10% haste, but also a 20% reduction of damage taken. Vampiric Blood: Increases maximum health by 30% and all healing received by 30% for 10 sec. 1.5 min CD. This has two main uses. It can be used prior to a heavy hit to increase the max health, or it can be used after a large attack to allow for healing.